The stars' contrasting styles at the Global Citizens festival fired up a national discourse that failed to address the importance of bringing our whole selves to work. 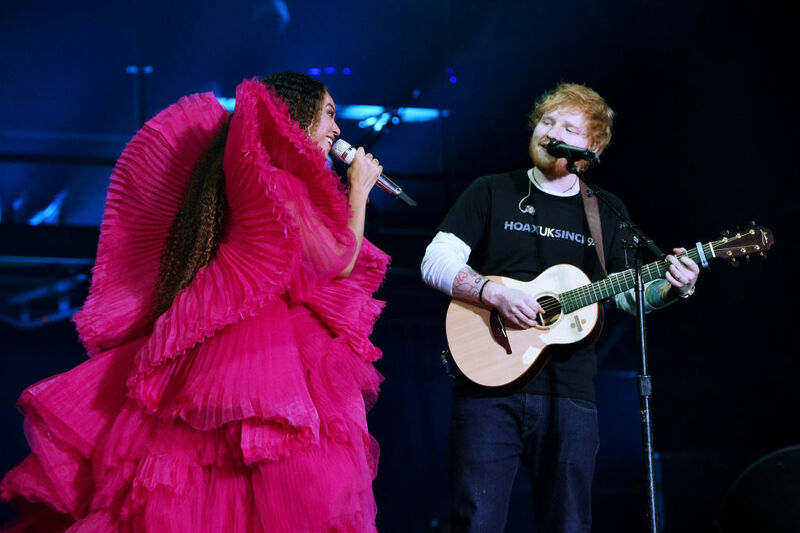 At the Global Citizen festival in South Africa, singer Ed Sheeran, casually clothed in blue jeans, sneakers, and a black t-shirt, took center stage alongside Beyoncé, who wore a ruffled fuschia gown with impeccably styled hair. The sharp contrast between the recording artists’ fashion choices triggered Twitter outrage, and numerous think pieces that railed against the aesthetic expectations placed on women and the disrespect some perceived in Sheeran’s informal choice of clothing. Writer Shon Faye fumed in a fiery tweet: “Ed Sheeran is a 27 year old man. The fact we’ve enabled him to feel it’s ok to dress like this at all, let alone next to Beyoncé, really boils my piss.” The Guardian’s Hadley Freeman, in turn, took a swipe at the uneven beauty standards imposed on women. “While most of us accept to the point of no longer even noticing the absurd differences between what men and women have to do to look acceptable, the disparity here was so ludicrous that it verged on satire,” she wrote. But another chorus of critics defended both performers’ looks: “This is Beyoncé. She always goes above and beyond with what she wears. This is Ed Sheeran. He always wears comfortable clothing when he performs. Why? Because they both have their own style,” a woman in Indianapolis, Ind. chimed in. Plenty of research suggests that the symbolic value we attribute to certain types of clothing — a power suit, say, or a pair of jeans — affects our performance at work. In one study, men who wore formal business attire scored better deals in negotiations than those who dressed down. In another study, participants who wore a doctor’s lab coat made half as many mistakes as those who did not. Dawnn Karen, the founder of Fashion Psychology Success, says the takeaway from these studies is not a prescription for how we ought to dress, but rather a reflection of how the participants felt inhabiting the particular clothes they wore. Feeling comfortable in your clothing, Karen says, facilitates productivity and brings your best self to the fore — especially at work. In this case, both artists appear to have done just that. “Ed [Sheeran] feels empowered dressed casually,” she observes, “as opposed to wearing a suit, which might make him feel rigid and confined.” In turn, if Beyoncé feels most comfortable in her workplace — that is, the stage — in a glam ensemble, so much the better. As much as possible, it’s always a good idea to work in clothing that makes us feel comfortable, productive, capable, and like our true selves.